Tiki Bar & Grill (owner John Campbell on right) wins Golden Shrimp Award at ShrimpFest in Sebastian, Florida. 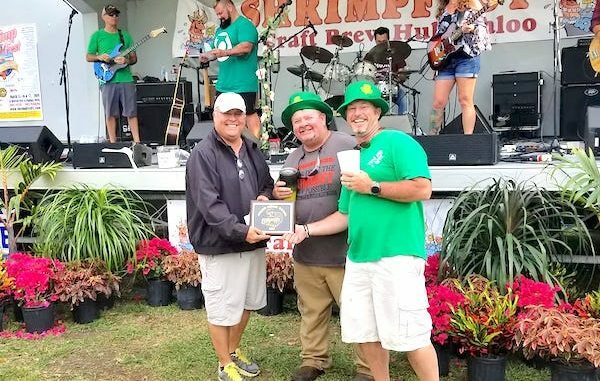 SEBASTIAN – The Tiki Bar & Grill won the Golden Shrimp award at the 2019 ShrimpFest & Craft Brew Hullabaloo. Tiki Bar & Grill served garlic better shrimp during the event. They have won the Golden Shrimp award for two consecutive years in Sebastian. The ShrimpFest got off to a rocky start last Friday when people were disappointed that the event wasn’t serving shrimp on the opening night at Riverview Park. The event planners told the restaurants that shrimp would only be served Saturday and Sunday. However, Tiki Bar & Grill decided to cook up some shrimp for festivalgoers. “I came [Friday] to clean grills and set up. Some people expressed displeasure, and I got permission to fire it up,” Tiki Bar & Grill owner John Campbell said. “This is a fun event that supports our local youth sports,” Campbell added. ShrimpFest tried to do something new this year, which didn’t work. They plan to make it even better for next year. Both Saturday and Sunday were very busy days at the festival with plenty of food, beverages, music, and things to do around Riverview Park in Sebastian. Congratulations to Tiki Bar & Grill!